Kapu (restrictions/prohibitions) were observed as a matter of resource and land management, among other things. Access to resources was tied to residency and earned as a result of taking responsibility to steward the environment and supply the needs of aliʻi. The social structure reinforced land management. Dwellings were thatched structures designed primarily for protection against inclement weather. Floors of the houses were raised platforms of lava rock, with small pebble layers. Pili grass was strewn about and all of this was covered with woven lauhala mats. Most activities (i.e. cooking and eating) took place outdoors. 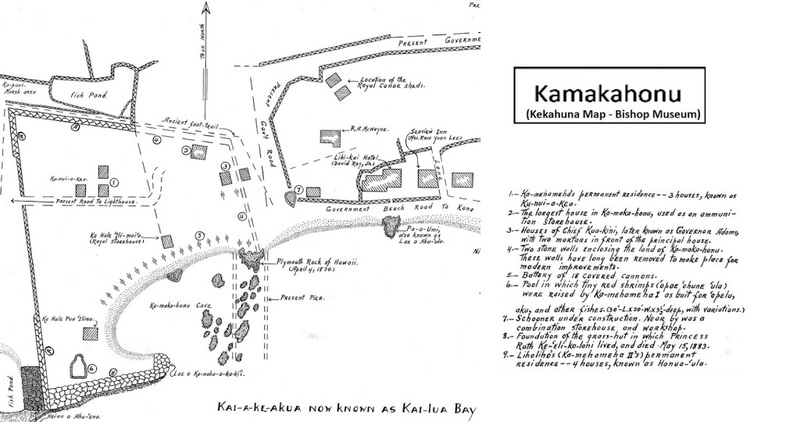 The konohiki served as general manager responsible for the use of an ahupuaʻa as a resource system. He, in turn, was assisted by specialists, or luna. For example, the luna wai was responsible for the fresh water flow and irrigation system. 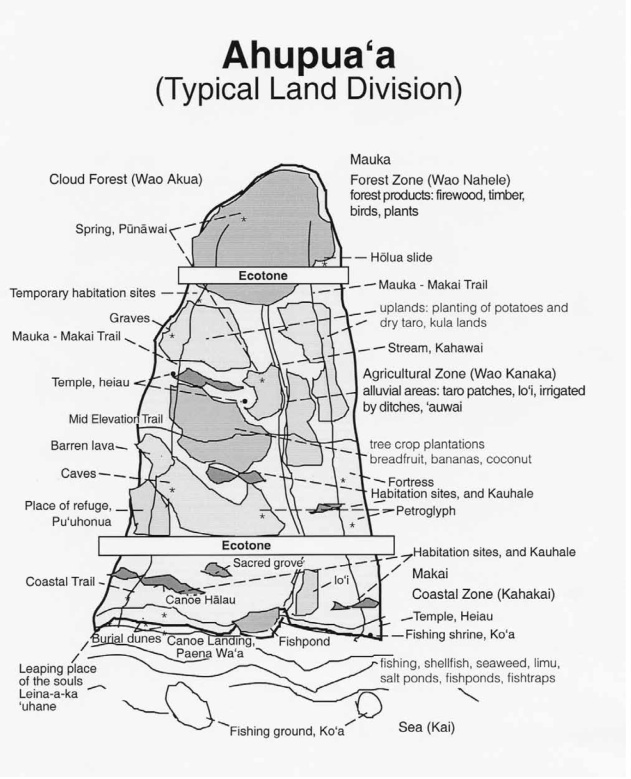 Additional markers were placed to note the ahupua‘a boundary – so called because the boundary was marked by a heap (ahu) of stones surmounted by an image of a pig (pua‘a,) or because a pig or other tribute was laid on the altar as tax to the chief. People living in one ahupuaʻa were free to use whatever grew wild in that ahupuaʻa. But a resident of one ahupuaʻa could not take anything from another ahupuaʻa. Boundaries were important and people carefully learned their locations. Wild and cultivated plants provided food, clothing, household goods, canoes, weapons and countless other useful products. Many land and sea creatures utilized for food also provided bones, teeth, skin and feathers for tools, crafts and ornamentation. Trees for canoes, house building, idols, etc came from the forest zone. Below the forest, in the Upland area, bamboo, ti and pili grass for thatching houses and were collected. Within the coastal area and valleys, taro was cultivated in lo‘i; sweet potato, coconut, sugar cane and other food sources thrived in these areas. The shore and reefs provided fish, shellfish and seaweed. 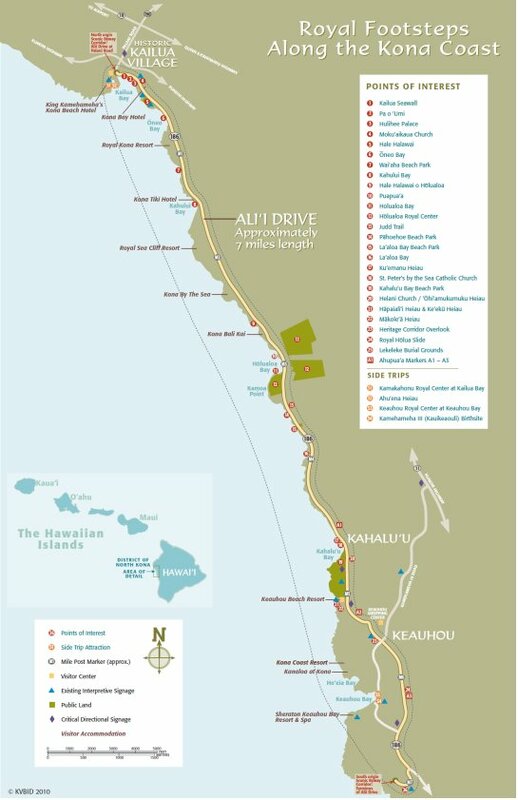 In preparing the Corridor Management Plan for the Scenic Byway on Aliʻi Drive, we recommended that ahupua‘a markers be placed along the corridor to note the historic land divisions. We are recommending the same at Kōloa, Kaua‘i for the Plan we are working on there. In addition, I posted some recent attempts of modern representations of ancient ahupua‘a boundary markers in parts of the State (primarily Ko‘olaupoko on O‘ahu and Keauhou on Hawai‘i Island.) These are in a folder of like name in the Photos section on my Facebook page.